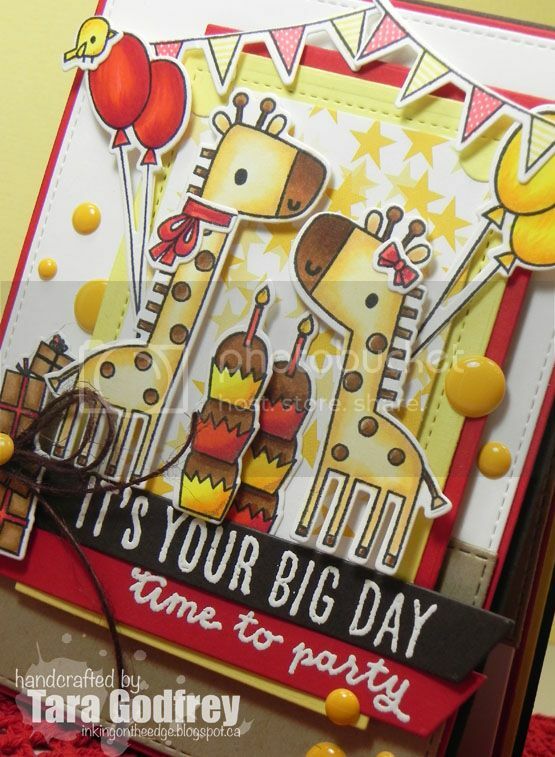 Inking on the Edge: Reverse Confetti - SFYTT # 38 & CTD # 399 - It's Your Big Day! Reverse Confetti - SFYTT # 38 & CTD # 399 - It's Your Big Day! Hello stampin' friends! 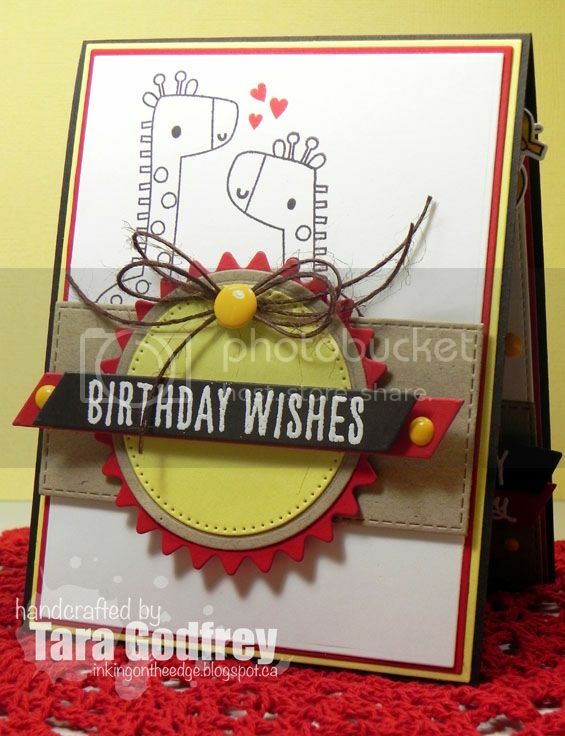 I've been enjoying the Canada Day long weekend and even found a little time to do some stamping as I had a very special birthday card to make with the Reverse Confetti Stamp set - Lift Me Up. I made this card for my darling daughter, Hannah, she turns 17 years old today!!! I can't believe it...(feeling old)! Hannah is SO grown-up...she's driving, has her first part-time job at McDonalds and just one more year of High school ahead of her before she goes off to University....we're beaming with love and pride! 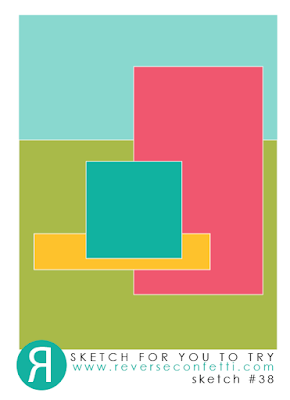 I used the new July SFYTT # 38 for the layout of my card. I flipped things around a bit and put the smaller panel on the bottom of the card. 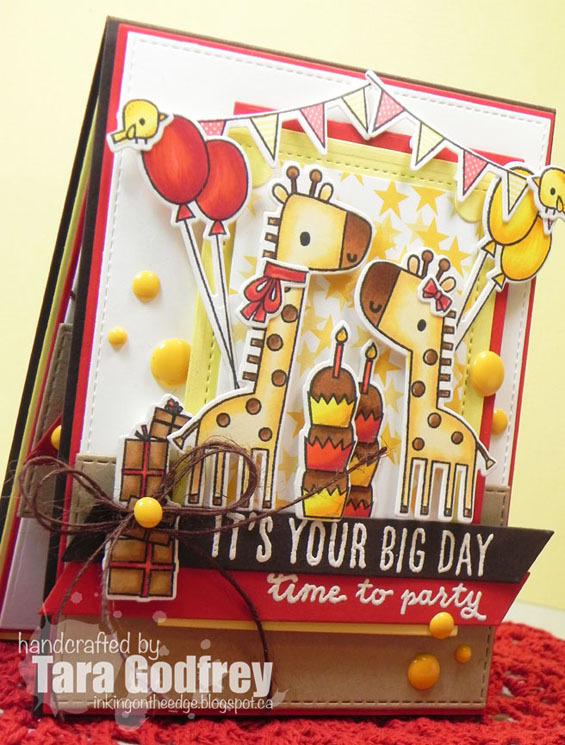 I popped up the giraffes on the stars Quick Card panel from the So Very Spring Quick Card Panels and tucked in the Insta-Frame Confetti Cuts. 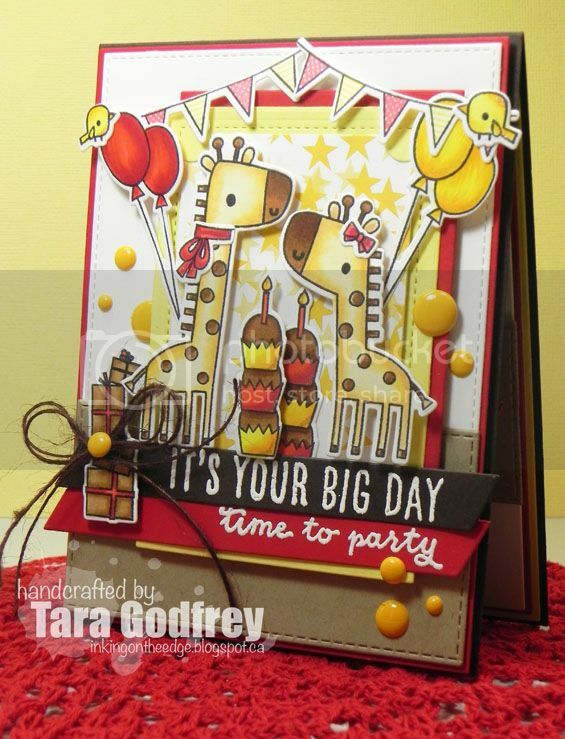 The balloons are from the Monkey Business Stamp set and the banners are from the Leaping Lions Stamp set. I stamped the sentiments from the Reverse Confetti Celebrations Stamp Set and embossed with Zing White embossing powder. I embellished with some brown AC Hemp twine and yellow YNS Gumdrops. I finished off the inside of the card too....and embossed another sentiment from the Reverse Confetti Celebrations Stamp set. Thanks SO much for poppin' by and havin' a wee peek at my Reverse Confetti, Lift Me Up, birthday card for my daughter's 17th B-day. 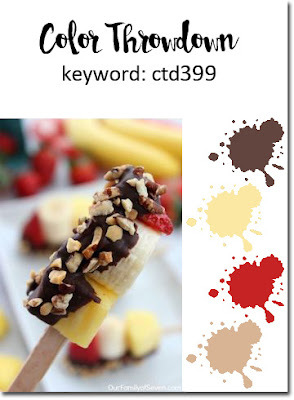 I'm entering this card in RC SFYTT # 38 and The Colour Throw Down # 399! Tara! I ADORE this...such a fun card! I always love all your details! Wonderful!! Perfect for the colors and sketch!! You blend elements/ images perfectly! So glad you joined us at CTD!! Oh, how fun and fabulous! Wonderful card, so fun for your daughter! I love all the colorful details....and, today is our daughter's birthday, too, she's thirty-six and also taller than me! I love it, beautiful ''scene''! congratulations for your daughter, beautiful age! What a fun card! So many interesting details to look at!! Thanks so much for playing along with us at the Color Throwdown! This is a winner! My goodness, it is a work of art! Love this, Tara!